So far, I made two pairs of the same pattern from FiberTrends: a pair for my husband and a pair for my mom (I'm the one still without proper slippers). For this time, I decided to knit the pattern with a single sole. I didn't have the exact yarn required by the pattern, therefore I made few samples as advised on the pattern: casting on 15 stitches and work in stockinette for 20 rows, then cast off. 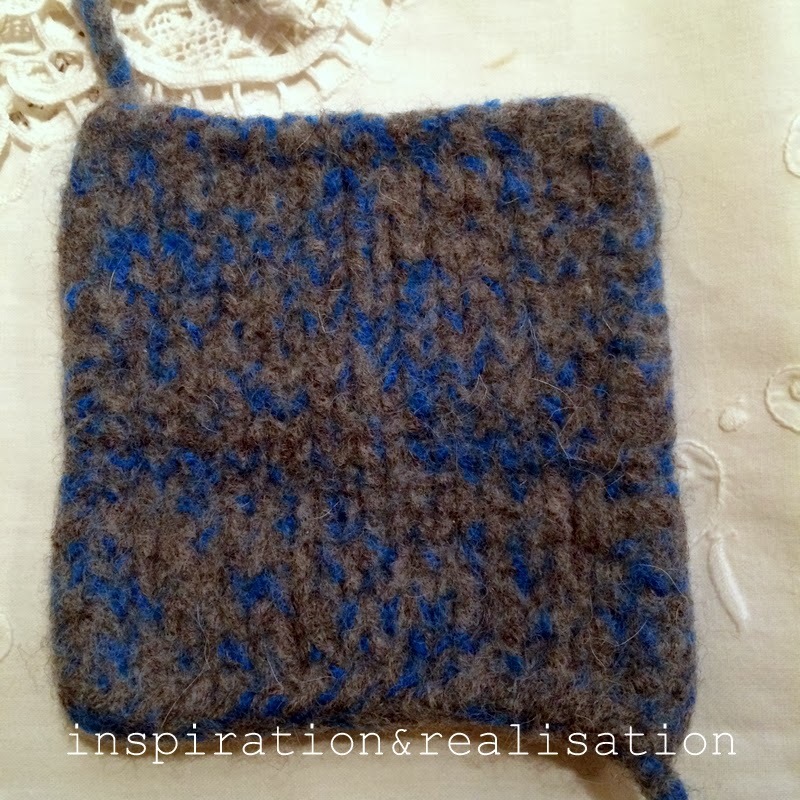 After felting, the sample with the right yarn should be a 4" to 4-1/2" square. I have a front loading washing machine, which makes things a bit tricky when it's about felting. So I set the maximum temperature, load my washing machine with 4 large towels, and placed the clogs in separate mesh bags. 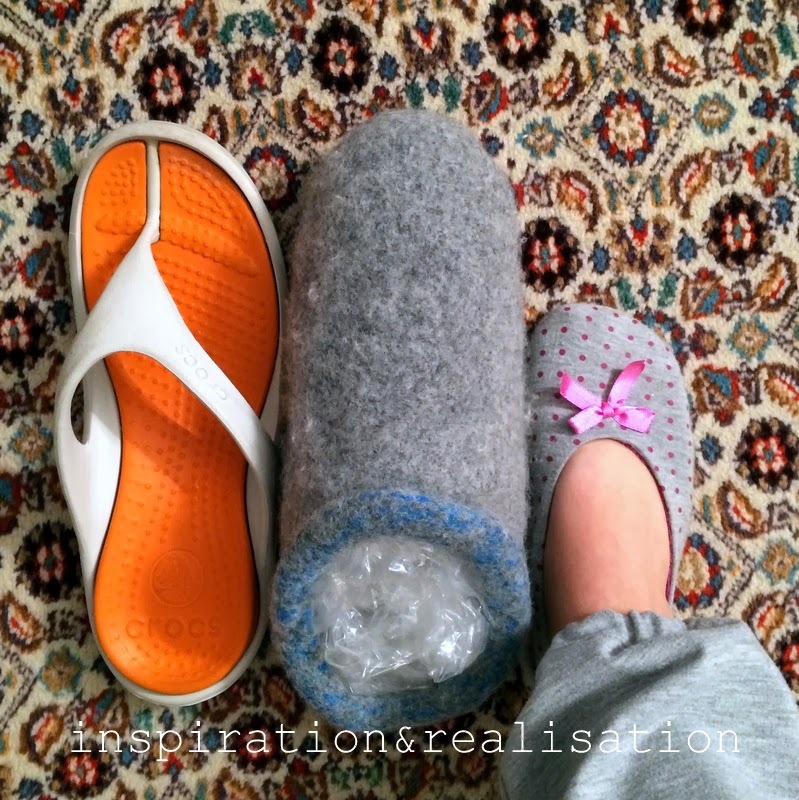 After the first cycle, the slippers were still big, so I did a second turn. of the same kind of wool. I used the grey and royal blue for the sole and cuff, and plain grey for the top. After felting, filled with plastic bags to keep the shape while drying! 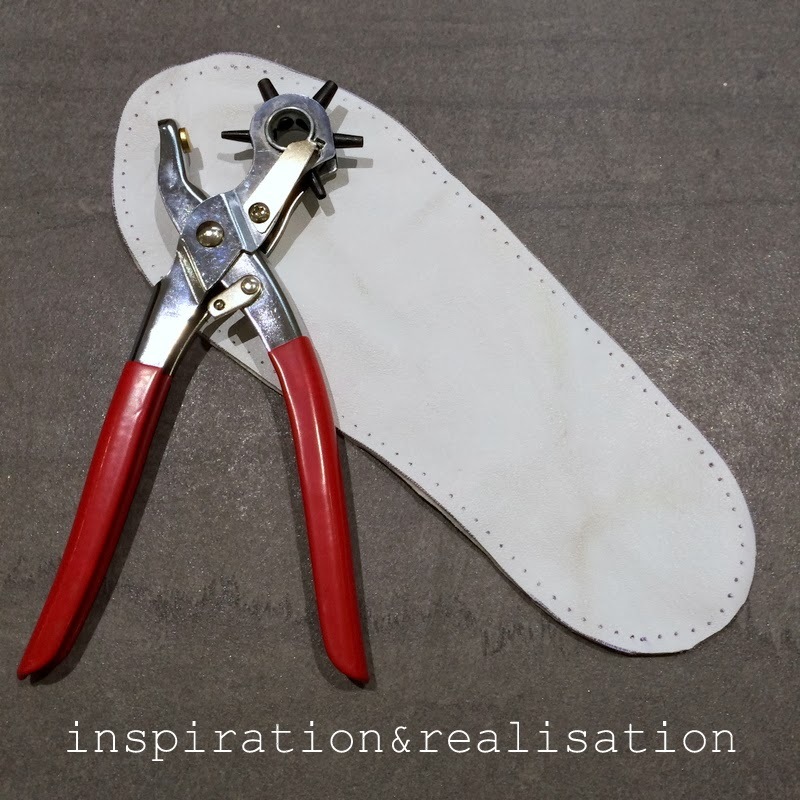 I made the leather soles using an old bag that was no longer usable due to stains. 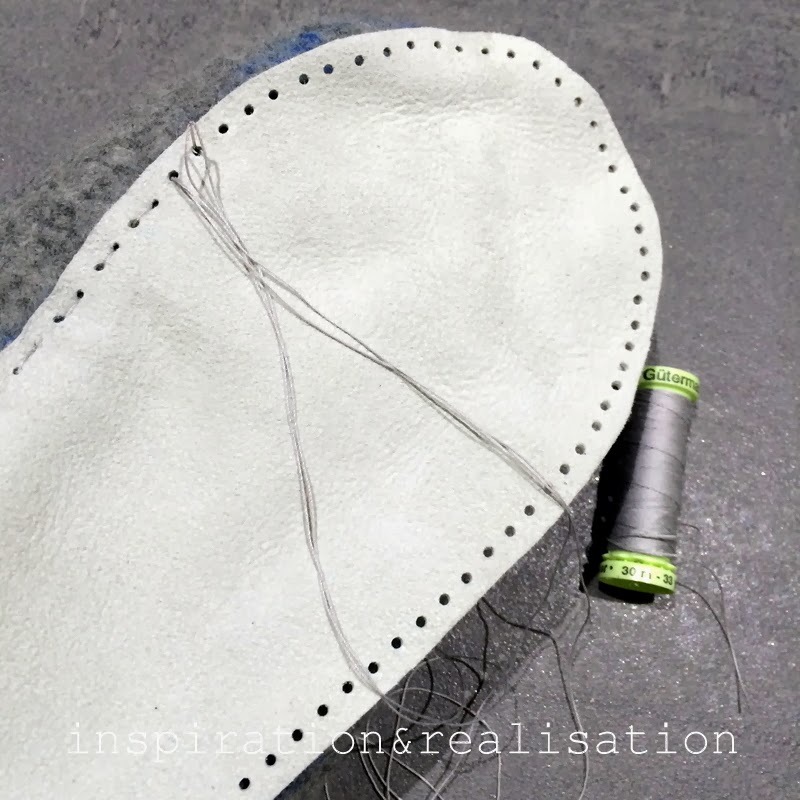 Cut the shape of the sole on a piece of card-stock, and measure on the sole of the slippers to make sure that is the right size. 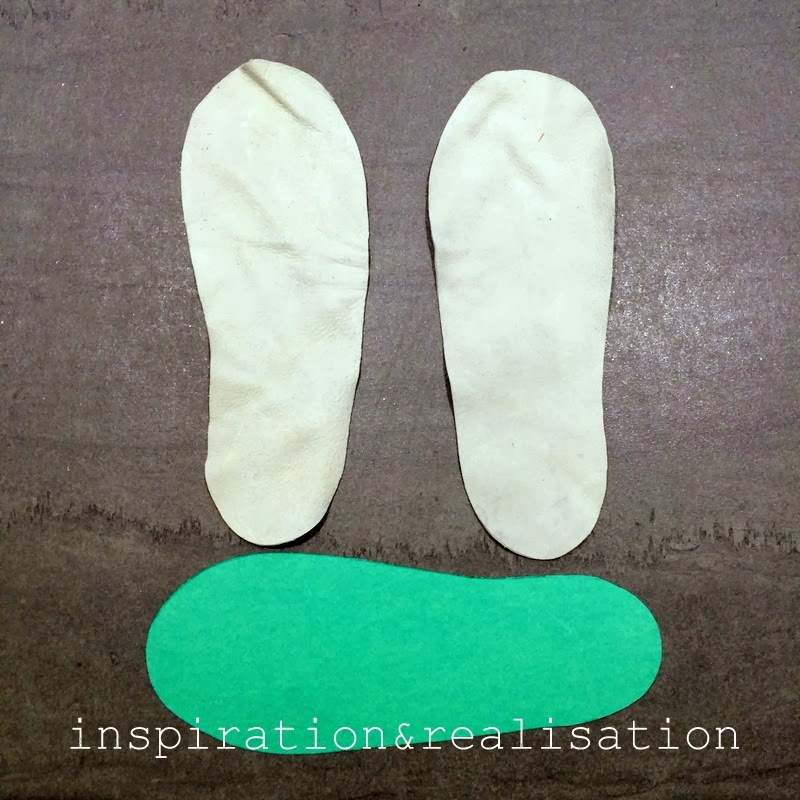 Trace the shape of the sole using the card-stock template: once on the right side, once on the wrong side, so you'll have a perfectly matching right and left. whit use, there will be a right and left. 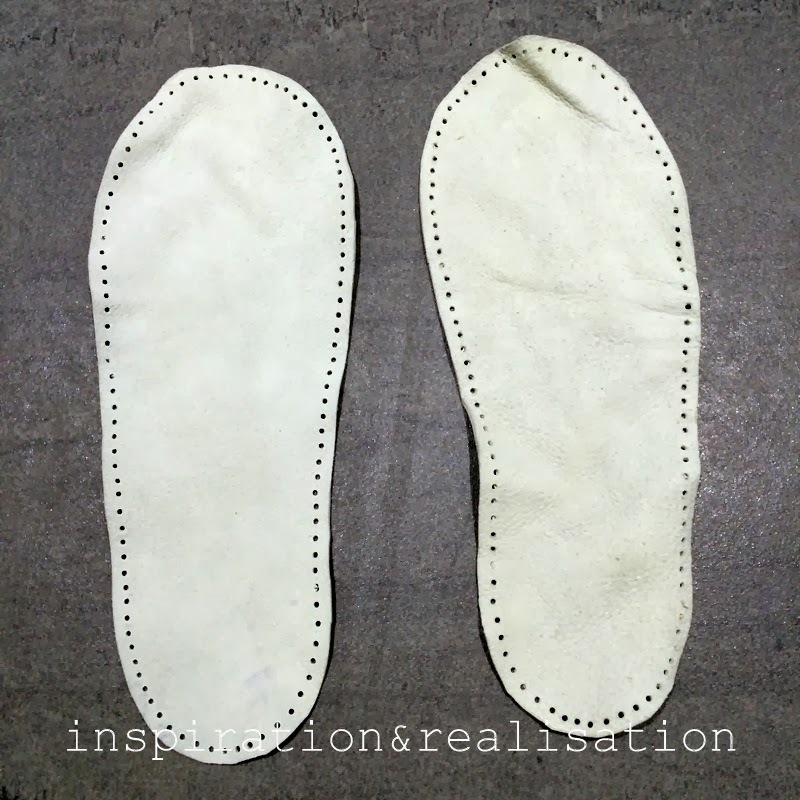 marked the soles with a dot every 1/4"
I promise, 15 extra totally worth it minutes! the suede will add grip to your steps. These are my mom's knitted slippers before felting. My mom wears a size 5, so I used the pattern of the size 6, with a smaller size needles. 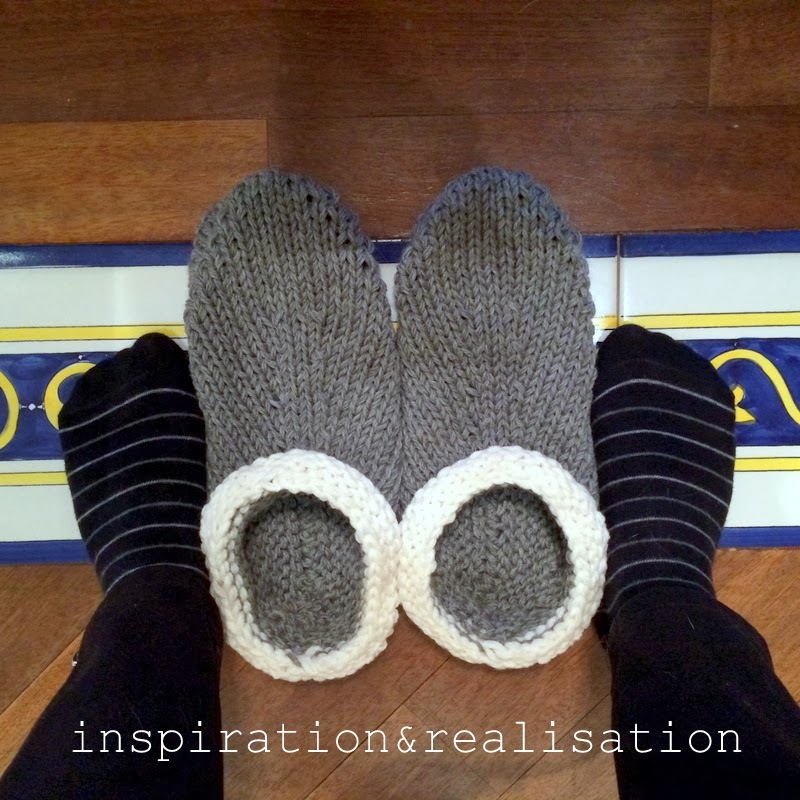 For the cuff, I used a contrast wool... which didn't felt the same way as the rest of the slippers. So I decided to keep the cuff in place and add a red stitching. Worked out well at the end! Hi Anita! 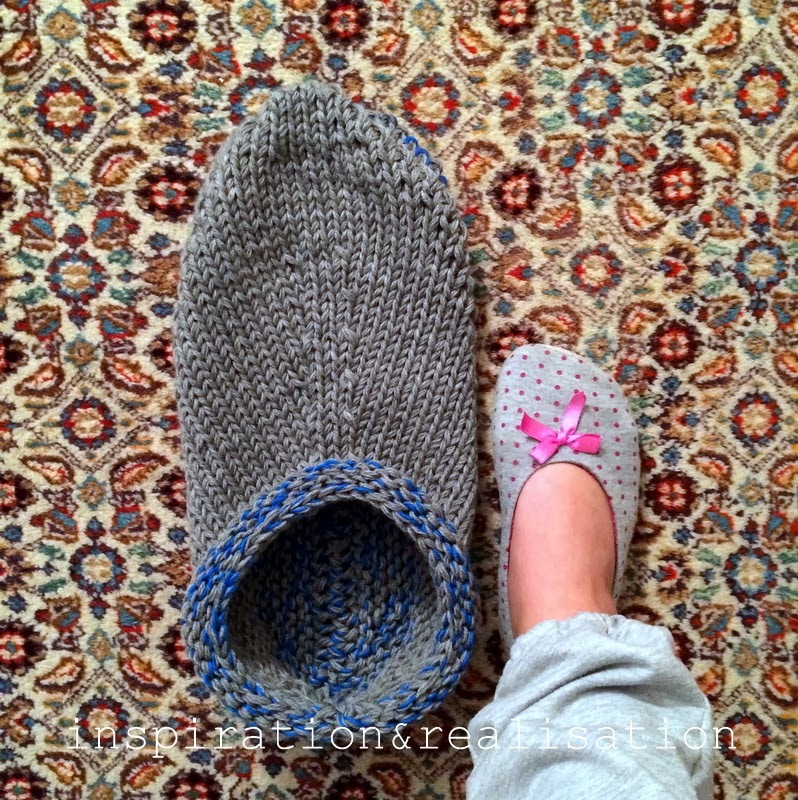 The smaller size takes about 3 hours to knit for each slipper... 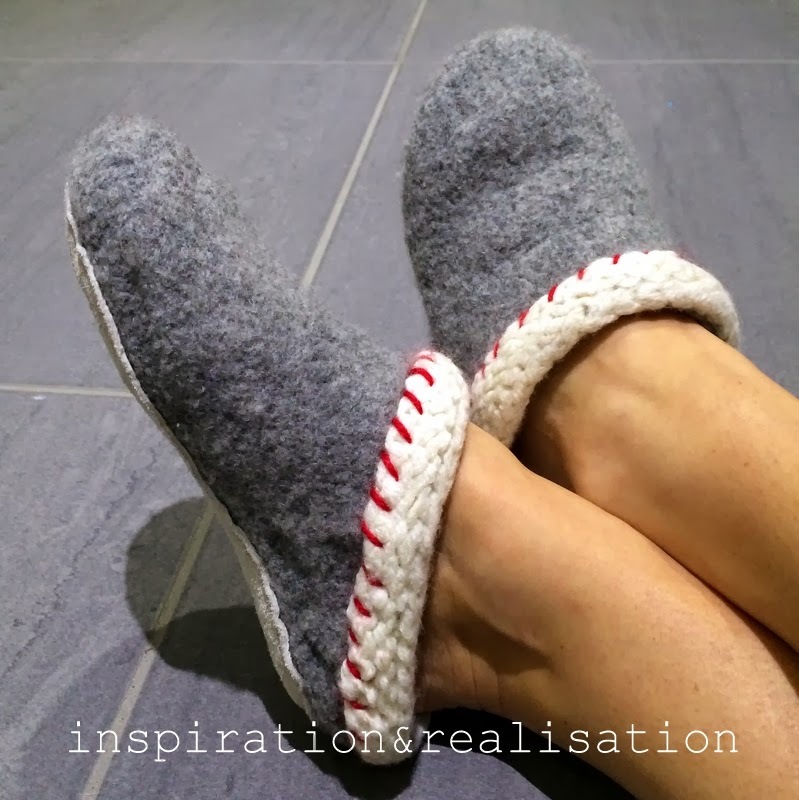 It's not a big commitment and they are comfortable and warm!! 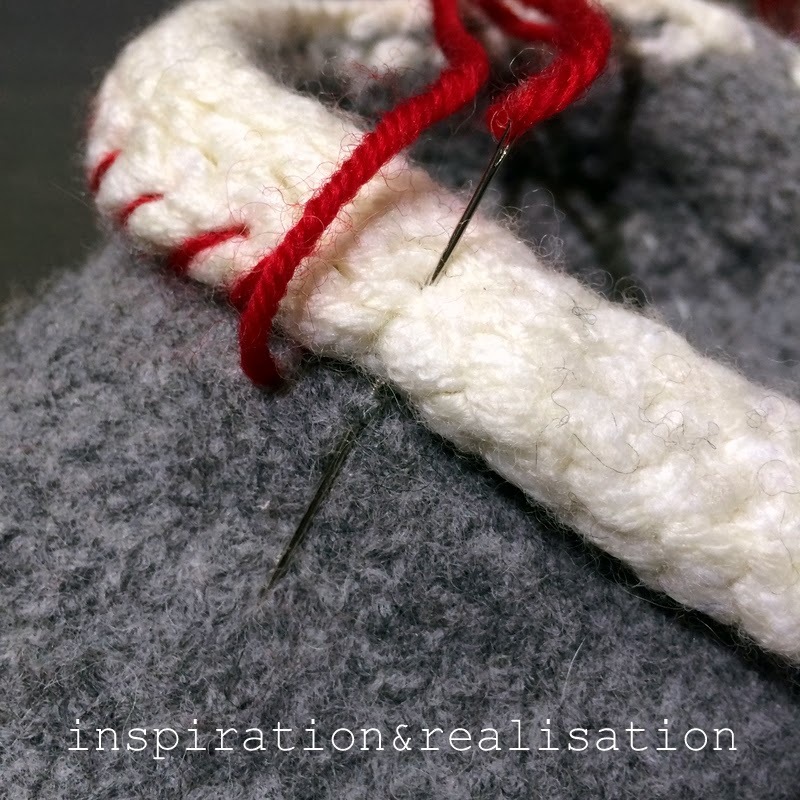 Is felting the same as shrinking? 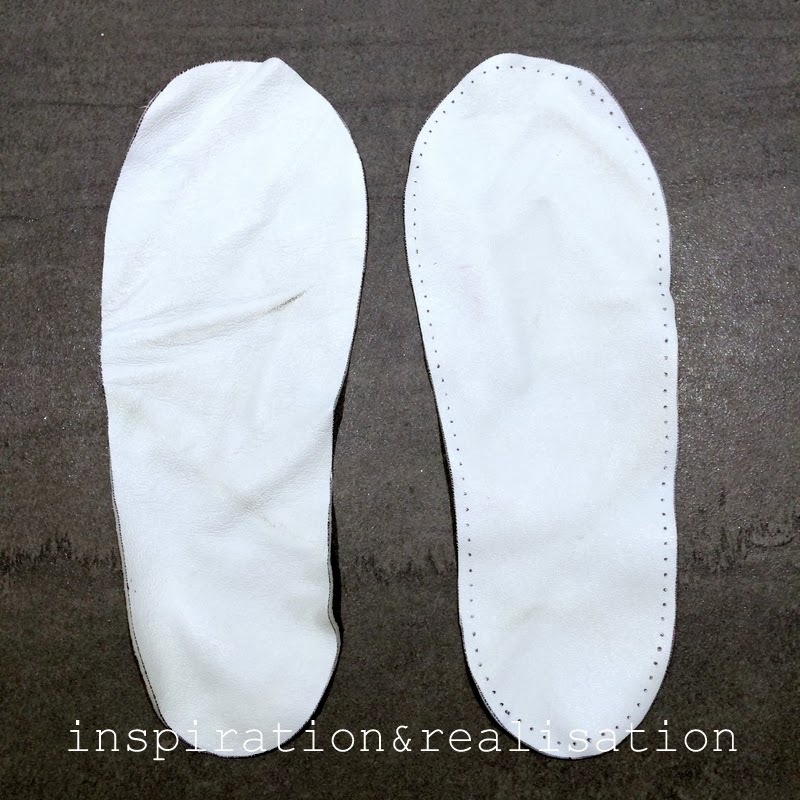 After a year of use, would you still do the soles the same way? I was wondering if the thread would wear off rather quickly, when you step on it.